A good teacher has greater influence in shaping the life of an individual, even more than his/her parents. In our country’s culture, a teacher has been given a place above the almighty God. A good teacher’s proper guidance and support is very important in achieving one’s goal in life. We Indians, who take great pride in reinventing good traditional practices, celebrate TEACHER’S DAY every year. Teachers’ Day is celebrated on 5th of September to honor and acknowledge the contribution made by Dr. Sarvepalli Radhakrishnan who was born on 5th September, 1888 and countless numbers of teachers in helping and moulding the careers of lakhs of students and in turn shaping the destiny of India. Dr. Sarvepalli Radhakrishnan was a great scholar, philosopher and teacher of modern India and also the 2nd President of our country. 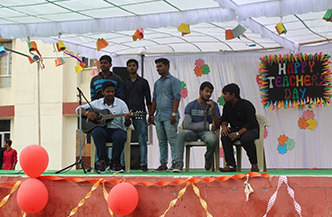 The programme started with the tribute to all the teachers by the students. A beautiful documentary film was created by the students. The film was truly fascinating and wonderfully made. Chairman BOG, Shri R S Tomar appreciated the students for their great performance and wished them great success in all their work in life. He also spoke about the role of a teacher in the lives of the students and how a teacher is respected for all that they do for the students and the society all over the world. 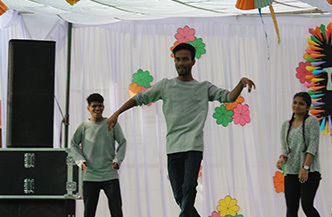 In the second phase of the function which started after some time in the main lawns of the campus, was graced by Chairman BOG, Shri R S Tomar, Principal, RIET, Dr. Saroj Hiranwal, , Dean Academics, Prof. Kapil Dev Sharma, Vice Principal RIET,Dr Sachin Sharma, and all the respective HODs. The function started with the tribute to The God Almighty and by the lightening up the lamp in front of Dr. Sarvepalli Radhakrishnan. 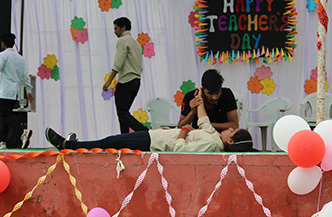 The stage was further handed over to the students for the next performances. 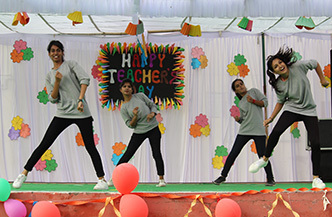 The students carried the function with tagging of teachers and many cultural performances as singing, dancing, play and the musical band performance. In her special speech, Principal RIET, Dr. Saroj Hiranwal said that for a student, development in character and values comes first. If the students can work over such traits then only they can be good students. Teachers play a major role in making their students responsible citizens of tomorrow and good human beings. It is impossible to imagine our lives without teachers. They are the foundation stone of our future. 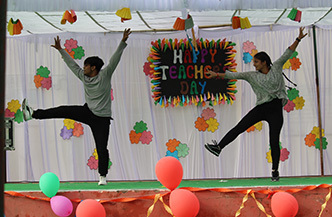 We can never thank our teachers enough for their immense contribution in a student’s life. Teacher’s Day is celebrated to show our acknowledgement and recognition of the hard work put in by our teachers towards our development. 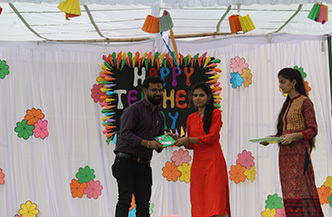 She highly appreciated the students for all their creativity.She further thanked all the students for their enthusiasm for the beautiful function and the respect shown to the teachers.